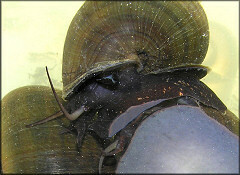 Pomacea paludosa is the largest native freshwater gastropod found here in Duval County within Northeast Florida. The species is reportedly more common in southern and warmer areas of the state where it serves as a primary food source for the Limpkin (Aramus guarauna) and the endangered Snail Kite (Rostrhamus sociabilis). Pomacea paludosa has thus far been found at 40 locations in Duval County where it co-exists with three other members of the genus; P. diffusa Blume, 1957, P. maculata Perry, 1810 and P. canaliculata (Lamarck, 1822). The latter three are not native to Florida but were probably intentionally or unintentionally introduced as a result of the aquarium trade. In his 1984 work(1), Dr. Fred Thompson reported the following about Pomacea paludosa: "Widely distributed throughout the Florida peninsula, and occurring sporadically west of the Suwannee River to the Choctawhatchee River. 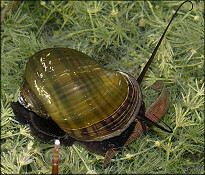 The Florida Applesnail occurs in Cuba. It is found in Georgia in isolated springs along the Flint and Ocmulgee rivers and is introduced in Covington County, Alabama, in a small reservoir artificially heated by industrial wastewater. Otherwise the species is not able to survive the lower winter temperatures that occur along the northern tier of Florida counties and northward. It has been introduced extensively into Pacific islands and southeast Asia, where it is raised for human consumption. The species has existed continuously in the Florida peninsula since the Pliocene." Observations since Dr. Thompson's work suggest that Pomacea paludosa is considerably more tolerant of cold winter temperatures than initially thought. Confirmed finds of the species in Duval County continue to increase at a rapid pace and thus far include a small creek in an urban neighborhood (Red Bay Branch, Tree Hill Nature Center) 2 (2005), a borrow pit 4 (2005), as well as the other numbered locations listed below. The variety of habitats involved indicates that the species is much more common in northeast Florida than initially believed and other populations await discovery. (1) Thompson, F. G. 1984. 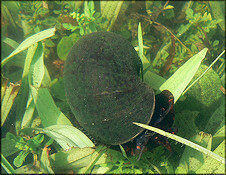 The freshwater snails of Florida: a manual for identification. University of Florida Press, Gainesville. 94 pp.